Home > Spotlight > What You Think is What Your Get! "We can never succeed until we believe we'll succeed." In one of his skits, Flip Wilson (dressed like his famous female character Geraldine) would say, "What you see is what you get!" As entertaining as that statement might be, it's not exactly true. What we see does not always determine what we will get. On the contrary, what we think-what we believe and pursue with all our strength-is the single most important factor in determining our level of success, happiness, and joy in life. That's the lesson taught by the example of Thomas Edison. Did you know that Edison failed in over six hundred experiments to create the electric light bulb before finally celebrating the joy of success? Over six hundred times Edison could see only darkness and failure, yet HE NEVER QUIT. He knew that the invention of the light bulb was inevitable-so he determined that he would be the person to invent it. His success was not determine by what he saw-but by what he thought. "What YOU think is what you get!" This is one of life's greatest success secrets. Edison discovered it to be true. So have people like Armand Hamer, Mary Kay, William Randolph Hearst, George Washington Carver, Zig Ziglar, Earl Nightengale, Napoleon Hill, and Walt Disney. Study their writings. Read their biographies. These are people who learned to establish, reformulate, and forever ever amplify their life's goals based on their visions, hopes, and dreams. 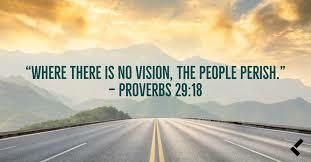 In the biblical book of Proverbs we read "without a vision, people perish." Terrific counsel! So how do we develop a vision for our lives. I would like to offer one great suggestion that works for every successful person I know. Follow this suggestion and you will begin to develop a mental vision for your life that will give you strength, direction, and purpose. Keep a Journal. Your journal should be different from a diary. In a diary we record at the end of the day our thoughts and reflections on the circumstances of our lives. A journal should begin at the other end of your waking hours. Use your journal to record your life in advance. Write down your hopes and dreams. Do it every day! Expand your dreams into goals that can move you step by step towards the fulfillment of your life's ambitions. Let your journal become your autobiography in progress. Study after study of those who engage in such a process of visioning and goal setting reveals that these persons are immediately launched into the top 5% of successful people in America. Do you want to be one of the top 5% of money earners in your profession? Do you want to be in the top 5% of successful entrepreneurs? Do you want to feel better about your life than 95 out of 100 people you meet? If you do then you must begin thinking big dreams and setting meaningful goals. Rewrite, review, and reformulate them daily. If you begin this one solitary discipline it will revolutionize your life. "Without a vision, people perish." Conversely, people with vision will thrive. Why? Because a vision provides hope! There is nothing like hope to get your mind and spirit moving in a positive. Consider the study conducted on concentration camp survivors. What were the common characteristics of those who survived the torture and disease in the camps? Victor Frankl was a living answer to that question. He was a successful psychiatrist before the Nazis threw him into such a camp. "There is only one reason," he said in a speech, "why I am here today. What kept me alive was you. Others gave up hope. I dreamed. I dreamed that someday I would be here, telling you how I, Victor Frankl, had survived the Nazi concentration camps. I've never been here before, I've never seen any of you before, I've never given this speech before. But in my dreams, in my dreams, I have stood before you and said these words a thousand times." Remember that it is not what you see but what you think that determines what you get!